match made in heaven? 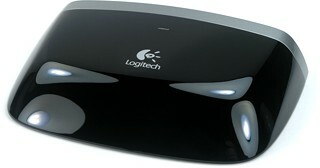 Logitech, the company known for their extensive game console accessories, their Bluetooth computer accessories, and their ever-popular Harmony line of universal remote controls, would certainly have been my guess for the most likely major brand name to immediately come out with an infrared-to-Bluetooth adapter to deal with Sony’s difficult-to-control PlayStation 3. And yet for months and months after the console was released, not a peep was heard out of the Logitech camp. Other innovative entrepreneurs filled the void with their own solutions, so that by the time Logitech finally did announce their Harmony Adapter for PlayStation 3, a full two and a half years had elapsed. Better late than never! As the sixth PS3 Bluetooth converter to hit the market, the Harmony Adapter (model E-R0001) would need to differentiate itself by offering either an advanced feature set, or aggressive pricing – and in this case Logitech has opted to go with pricing. At $59.99 USD MSRP it’s one of the least expensive adapters in the roundup, especially when you consider that it comes with an AC/DC power adapter and doesn’t require the purchase of anything else. Logitech is very purposefully not marketing the Harmony Adapter as the be-all, end-all of PS3 Bluetooth converters. In fact, its economical price status is directly proportional to its feature set – which is to say it only has the basics: conversion of infrared signals to Bluetooth. Everything else... was deemed unnecessary. The adapter is compact and stylish, measuring 3.90” wide, 0.70” high and 2.50” deep (9.9cm by 1.8cm by 6.5cm). The entire front, top and sides are made of glossy black plastic that conceals the front infrared receiver. A bright power LED is positioned on top of the unit, while the back sports a DC power jack and a 2.5mm headphone-style jack for wired infrared input. On the bottom is a red [Connect] button, the only unit in our roundup to include something like this. The bundled power adapter is a small outlet-saving model. For current Harmony remote control owners, the process of configuring their remote and pairing the adapter with the PS3 has been made especially easy as the Harmony software does all the work of getting the right codes and creating appropriate layouts. No configuration of the physical adapter is necessary or even possible; everything comes ready-to-use out of the box. First, add a Sony PlayStation 3 to your configuration from the “Game System (with DVD)” category. Download the configuration updates to your remote and take both it and the adapter to your PS3. Plug the adapter into a power source and enable remote pairing mode on the PS3. 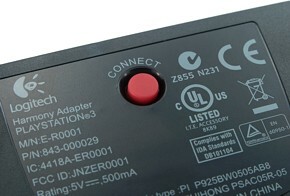 Press the [Connect] button on the bottom of the adapter and the PS3 should indicate that pairing is complete. Everything’s now ready to use! The Harmony Adapter supports the full 51 functions from the original Sony Bluetooth remote control. A special “PS3 Off” command is included in the Harmony database for an automated shutdown macro. The associated commands are sent directly from the remote, and not from a macro stored onboard the adapter – this was likely done in case the macro needs to be changed in the future, as the unit is not updateable.